The census data on journey-to-work can be used to analyse where and how people are travelling, based on where they live and work. This gives some important indications of where different modes are effective, and where they could be, with some support. The data for 2011 is now available, so this analysis allows us to see the effects of the parking restrictions at the hospitals and Oxford Brookes University that have been introduced since 2001. The detailed analysis now excludes people who have no fixed workplace (shown as “mobile” on the diagram below), since we have no information on where they work. Oxford’s congestion problem is the result of too many people driving. People who drive out of Oxford, and people with no fixed workplace are probably less of a problem – their journeys don’t tend to concentrate on key destinations, or at key times. The people who drive in from outside generally travel further overall than those who just drive inside the city, but in terms of congestion, their impact is similar. The number driving from outside is almost triple that from inside, but both are substantial. The total number of drivers is about 43000. The driving figures include about 4000 drivers, mostly from the rest of Oxfordshire (or further afield), who use Park & Ride. Oxford’s Park & Ride system is large, and makes a significant difference, particularly for journeys to the centre. But it still only intercepts about 15% of incoming drivers. We can also see where and how people travel to the main employment areas (the centre, Headington and the Cowley works area). Few people drive to the centre – forty years of parking control have had the desired effect – but driving has not been entirely eliminated. It’s noticeable that the highest source of driving from within the city is the area around the car works (Cowley), despite a bus share of over 50%. * A fair proportion of drivers will use Park and Ride. The modal split for walking from the rest of the county and beyond is nonsense, probably due to errors in coding the employment location. For half the city, the bus is clearly dominant for journeys to the centre (not as dominant as rail in London, but close). Cycling isn’t quite as dominant, but there are some ward-to-ward modal splits in excess of 50%, especially where there is no direct bus service. Cycling modal splits in the 20-40% range are quite common. Buses already have substantial bus priority on many routes, particularly from Headington/Cowley (by virtue of the High St closure) and from the north (bus lanes). So there’s a limit to what more can be achieved by improving bus quality. Parking is slowly being reduced, as businesses decide that land can be released for building. But there’s also probably an opportunity to improve the quality of the walking and cycling environment. Walking and cycling are already dominant from the inner wards, and offer the best opportunity to reduce driving further. Cycling is a substantial mode from Headington and Cowley (despite the hill), and there may well be opportunities to provide a clearer, more joined-up network for cycle commuting, relatively easily. The next biggest employment destination is Headington (principally two hospitals and Oxford Brookes University). The situation has changed since 2001 – there has been significant hospital expansion, new bus services, and stricter parking control. Driving has considerably reduced from the Headington area and from inner districts, but also from Cowley and North Oxford. But there are still large numbers driving within the city. And there is a lot of driving from outside the city. So in terms of policy, it looks like there’s still scope for shifting from car to walk/cycle from the immediate surrounding area. Further work may be necessary to restrict car parking, especially around Oxford Brookes. Do the alternatives need to be improved? The main reason for improving the alternatives is to make parking restrictions more palatable. In practice there has been little improvement for walking and cycling, with most of the improvements directed towards bus users. Two new bus-only access roads were built, Park & Ride sites have been expanded, and new direct bus services provided. Some of the buses are still prone to congestion, and it’s hard to provide a service to a dispersed market. Bus use has increased, but it is noticeable that cycling and walking have both increased more. So it would be better to do more to improve conditions for cycling. The aim should be to provide cycle-friendly routes from all directions; in practice that means making every road cycle-friendly. Cycling is more effective as an alternative for the inner wards, and just as likely to be effective from the Cowley area. Nevertheless, there is a huge volume of driving from outside the city. That is why better bus services from the major towns, better connections across central Oxford, and more Park & Ride are all necessary. Coupled with parking restraint, it should be effective. The third big employment destination is the area around the car works (partly still a car works, but with other similar employers and a couple of business parks as well). A large number live locally, and despite a substantial level of walking and cycling, a lot drive. Bus is almost irrelevant. There is very little parking control. Again, the most immediate opportunity is shifting from car to bike from the immediately surrounding area. But can we get more people to cycle without parking control? It will probably require cycle facilities that are more attractive than the Oxford norm, but perhaps more importantly, a substantial cultural shift (more positive about cycling, less accepting of the need to provide parking for short-distance commuters). Fortunately, there are some pretty good cycle tracks along the ring road (it’s how people got to the works before they owned cars), but the tracks need to connect up better. The useful bits of main road need to be made cycle-friendly as well, so that people feel that they can easily go everywhere. 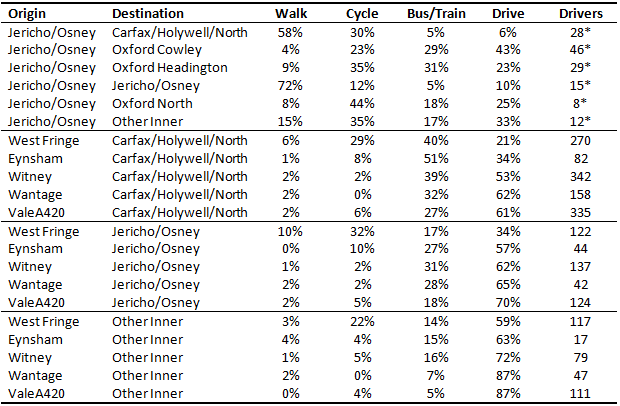 Can buses (or other public transport) play a significant role for travel between suburbs (eg from Headington to Cowley)? Public transport is only likely to be really effective if it is linked to parking restraint. The ring road provides a fast route between the suburbs, so it’s almost impossible for public transport to provide a comparable service. So the focus has to be on dealing with local journeys first, where it is much easier for the alternatives to be comparable. As with Headington, there is an increasing volume of driving from outside the city. Unlike Headington, there is no Park & Ride. It is hard to see how public transport could compete without severe parking restraint. The employment locations are scattered, and not easy to serve in multiple directions by public transport. It would be possible to upgrade the freight railway line to serve most of the employment locations, thereby linking them quickly to Oxford rail station. However, the economics of this are likely to be poor, unless it is directly subsidised by the offices and linked to parking restraint. It would probably be cheaper to build offices near the main railway station instead. So the immediate objective has to be to focus on short-distance trips, within the Cowley area, and make it easy to walk and cycle to all the employment sites. We may just have to put up with a high level of traffic on the ring road. Even though the proportion of drivers to the centre is fairly low, there is still congestion on Botley Road, Abingdon Road and through the science area, with Botley Road being the worst. The data allows us to look at who is probably driving on Botley Road, and what alternatives to driving are most likely to be acceptable. * As an origin, JerichoOsney is split, with about half the population in Jericho – thus having no peak impact on Botley Road. To take account of that, the driver numbers have been halved. This also needs to be taken into account when looking at the modal splits. Botley Road carries about 1000 cars in the peak hour in the peak direction. Some journeys to work will be outside the peak hour, but clearly the census journey-to-work data gives a good indication of the origins and destinations of a lot of the peak traffic. Journeys to the centre are the largest source of driving, despite a comprehensive bus service. But note that about 500 of these drivers use Park&Ride. Driving to the rest of the inner wards (Jericho & Osney, Other Inner) is also substantial. For these areas around the centre it is noticeable that bus use is markedly lower than to the centre, partly due to the availability of parking (especially on Osney Mead industrial estate), but also partly due to the difficulty of interchanging between buses in central Oxford. For the shorter journeys, cycling is a substantial mode, and often as important as the bus. While the cycle lanes along much of Botley Road are clearly valuable, the gap under the railway bridge, the problematic side roads further out, and the fairly poor conditions through Frideswide Square could all be keeping people driving. Bus use from Botley/Cumnor to the centre isn’t as high as many of Oxford’s outer wards, and cycling is higher – it’s more like Wolvercote than Cowley. Given the hill, that is a little surprising, but reflects the different demography, and the lack of clear high-frequency bus routes. The bus service is divided between four routes (one of which has two operators). Some rationalisation of services may be required, perhaps incorporating a new link between Elms Rise and Harcourt Hill. The lower level of bus use, and the inherent poor competitiveness when coming from any distance, makes it hard to make a case for further bus priority. Bus priority could be enhanced by holding back traffic at Binsey Lane, or by removing the turning lanes and installing an outbound bus lane. Buses are certainly being severely delayed by congestion. But because many drivers come from too far away, there aren’t likely to be enough switchers to make queue relocation or a reduction in car capacity feasible. It is probably more sensible in the short term to improve the quality of provision for cycling, to rationalise and coordinate the bus services, and to improve city-centre interchange. While this has looked specifically at Oxford in 2011, in the context of a long policy of parking restraint, there are some general lessons to be drawn. A lot of people drive quite short distances, and in many cases the most likely alternative to driving will be cycling. Buses work particularly well from outer council estates to the centre, especially when supported by parking restraint and bus priority, but are less effective from between-the-wars estates, or from towns outside the immediate urban area. The most effective policies for tackling congestion in Oxford are likely to be a mixture of parking restraint, providing a more cohesive network of cycle routes, particularly in the suburbs, and improving bus interchange in the city centre.